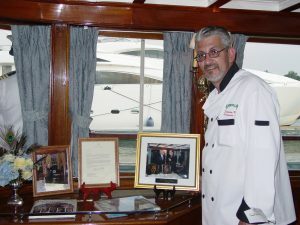 With over 250 government and business representatives from New York and Washington DC, as well as residents of Lower Manhattan and Sept. 11 family members benefited from the generosity of Goodfella’s Restaurant, Dongan Hills, during a VIP cruise on the Potomac River aboard the U.S.S Sequoia, the Presidential Yacht. Staten Island’s original Goodfella’s on Hylan Boulevard was asked to prepare and serve the meal as part of a fund-raiser sponsored by September’s Mission, a non-profit organization dedicated to honoring those whose lives were lost on Sept. 11. 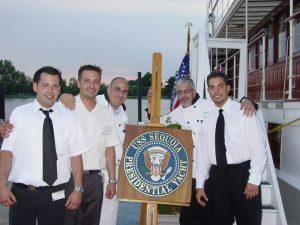 When the original caterer became unavailable just days before the fund-raiser in the nation’s capital, Monica Iken the organization’s founder, contacted Goodfella’s, giving the Staten Island restaurant the opportunity to contribute in its own way to the September’s Mission cause. Without missing a beat, Goodfella’s stepped right up offering their catering service free of charge. 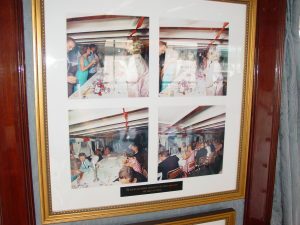 Ms. Iken became acquainted with the restaurant through the N.Y. Detoxification Project for Rescue Workers and Firefighters and a fund-raiser previously catered by the eatery. Impressed with the service, Ms. Iken saved a menu, hoping to work with the staff sometime in the future. Passengers aboard the yacht were surprised that Staten Islanders had traveled all the way form New York to help raise money for the cause. “We’re from New York. Isn’t this about New York?” said Chef Russo. The benefit gave participants a change to meet and discuss the goals of September’s Mission and the future of the World Trade Center site. With nine days, five passionate cooks, two kitchens, and an assortment of dishes to prepare, the crew made its journey to Washington D.C. in several private vehicles. With limited cooking facilities, preparing the meal was a definite challenge. “We only had a couple of portable ovens and sternos to work with,” recalled Russo. Luckily they arrived with their own supply of food. preparing several traditional favorites along with a few specialty items. The menu featured Lobster Ravioli in Vodka Sauce, Goodfella’s version of Lasagna, Tri-colored Tortellini, Rigatoni alla Vodka Sauce, Chicken Francese and Pasta Russo, the chef’s own signature dish. The evening began with a dockside cocktail reception, labeled “Past, Present, and Future,” and an inaugural “Angel Award” presentation, honoring New York State Governor George E. Pataki. 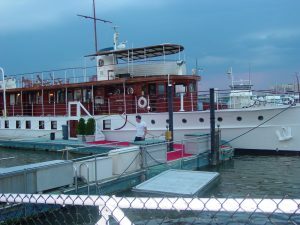 The highlight of the evening was “A Historic Voyage,” the Vip cruise aboard the Presidential Yacht, with dinner catered by Goodfella’s. The experience brought with it several rewards, according to Myers. “it was a good thing for us, a good thing for Staten Island and a good thing for September’s Mission,” he said.